It’s Happy Hour! 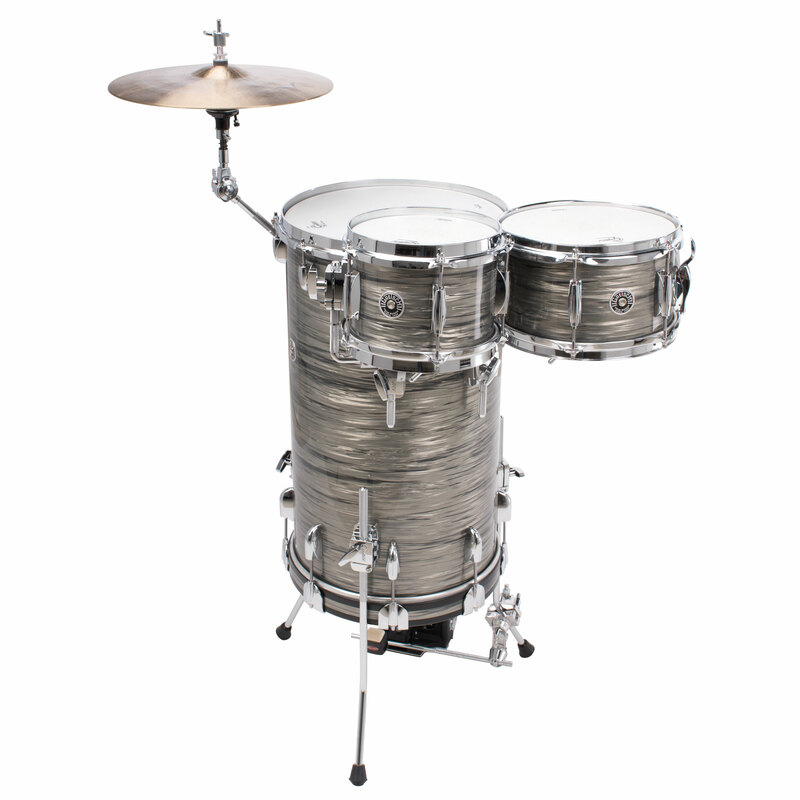 Peruse our menu of all (or at least most) readily available Cocktail Drum Kits on the market. 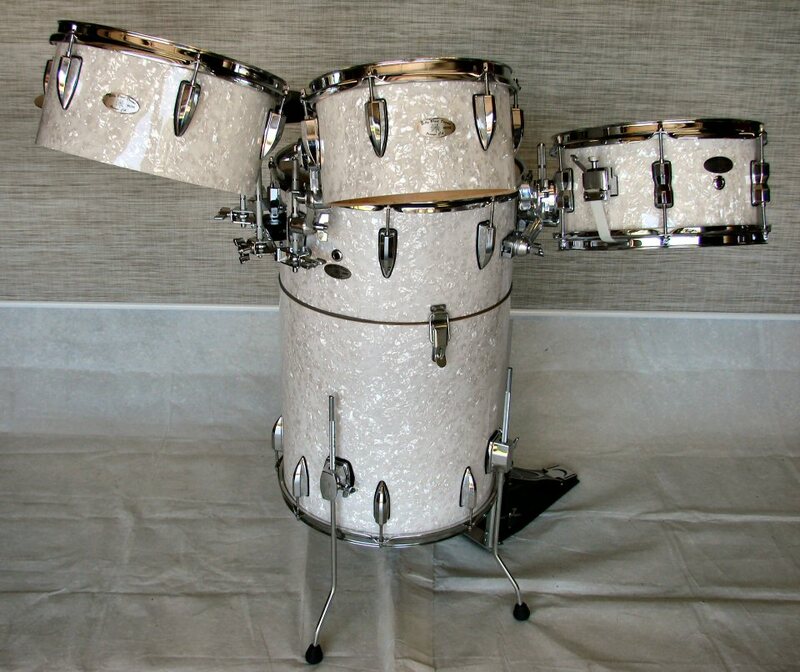 Whether you wish to sit or stand, our guide is the best place to start your search for the ideal Cocktail Drum Kit for your specific needs. May we recommend enjoying a dry Martini, Marguerita, or maybe a Vodka Tonic while checking out or menu? Listed in no particular order to comply with generally accepted Happy Hour de-regulations. Available in Indigo Sparkle (pictured), Vintage Burgundy Sparkle or Chameleon Sparkle, The Cocktail-Jam Kit from Tama blends a high-tech flair with vintage styling. Separating the low tom from the bass is a nifty touch providing added adjust-ability. We suspect the “pat-pending” statement is in regards to this feature, but is as of yet not confirmed. The rods connecting the two certainly provide ample opportunities for clamping on just about anything you wish to add, eliminating the need for clutter-some stands. 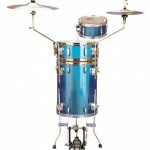 The US$833 List price includes 6″x16″ bass drum, 5.5″x14″ floor tom, 5″x10″ tom tom , 5″x12″ snare drum, drum pedal, drum bag, and hardware bag. Commonly advertised for around $500 A cymbal mounting attachment kit is available as an extra option (pictured). See the Full Scoop here! With a street price of under US$300, GP offers an affordable stand-up alternative. 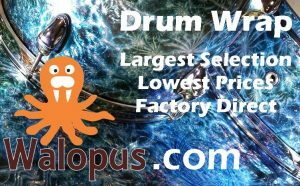 The price includes 8″ demi snare, 15″ standup floor tom, 10″ tom, 10″ (closed) high hat cymbals &15″ crash ride cymbal, heavy duty chain drive bass pedal, drum sticks & drum key, The kit is available in three wrap choices and sold at Amazon, Sears and other general retailers. As availability in specialized music stores is limited, it may not be a pro’s first choice. List price is US$460. We have not been able to find a website for GP percussion. Likely the most customizable Cocktail Kit on the market, with all of DW’s Finishes, Shell Materials, Hardware Colours and Shell Sizes available. 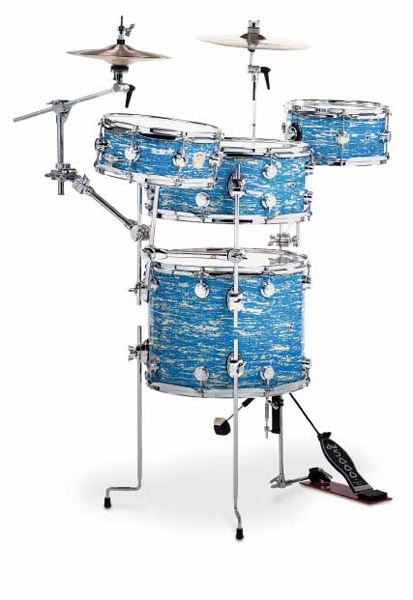 Combining many of DW’s patented innovations into one unique, travel-friendly set and utilizing multiple DogBone® clamps, the kit can be easily transformed into almost any configuration imaginable. 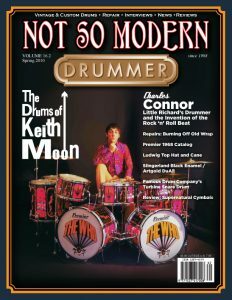 DW’s outstanding reputation is certainly reflected in the list price of roughly US$4,500 which includes a bigger than usual 18″ x 16″ bass drum, the unusual 18″ x 8″ “woofer tom” hovering over the bass, two toms, 12″ x 6″ and 12″ x 5″ and snare, as well as a “sidekick” version of the DW5000 bass pedal. 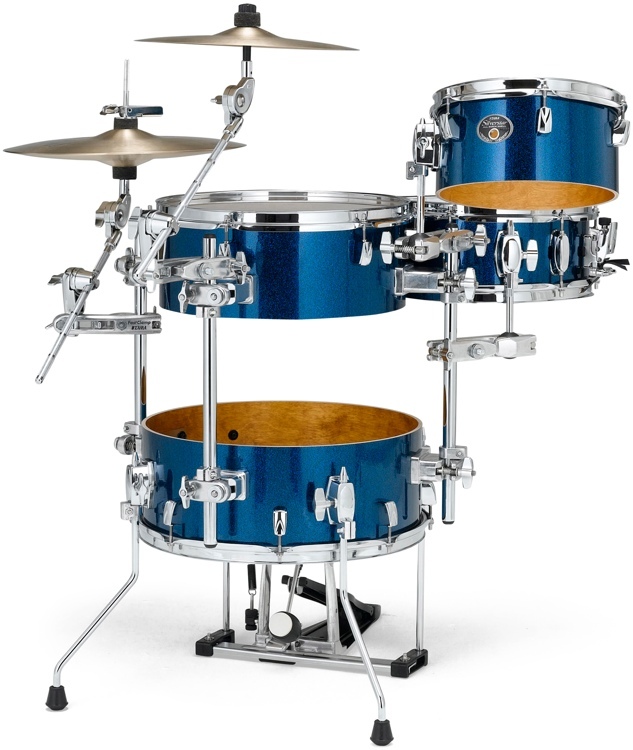 One of the more well known Cocktail Kits, the Peace Manhattan is available in eight finishes and a couple of configurations. The 14X18 bass drum is separated from the snare with a “sound-off” pad. 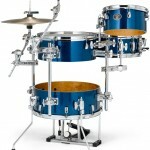 The 10″ tom and two cymbal arms are included in the US$1,400 list price for the lacquered finish version. The kit also comes with the reverse cam bass pedal which attaches to the legs. Additional toms are available. 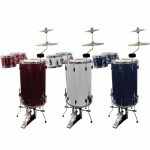 Trixon Drums USA offers three lines of Cocktail Kits, made with birch shells, in a huge range of beautiful lacquer and wrap finishes. 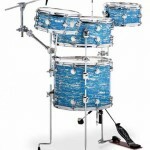 The “Cocktail” Series, features an 8″ by 5.5″ “Popcorn” Snare, 10″ by 5.5″ Tom and a traditional 15″ by 25″ Bass / Floor Tom. 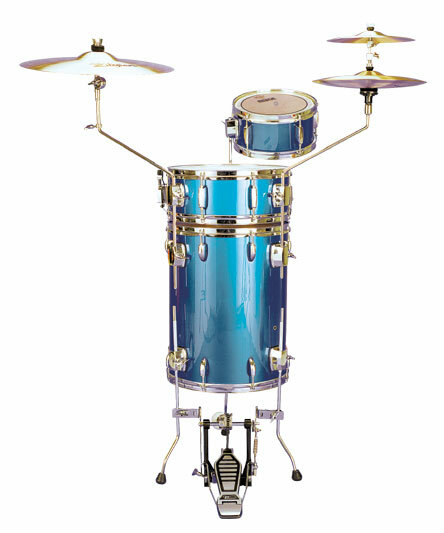 The “Cocktail Elite” Series seems to have the same specifications, while the “Vertikalen” Series mounts a separate snare above the bass drum. List prices for the Cocktail and Cocktail Elite versions hover around US$1,000 depending on configuration and Street prices begin in the modest US$300 range. The “Vertikalen” Series lists just a tad over the US$1,000 mark and retails for in the US$500-700 range. 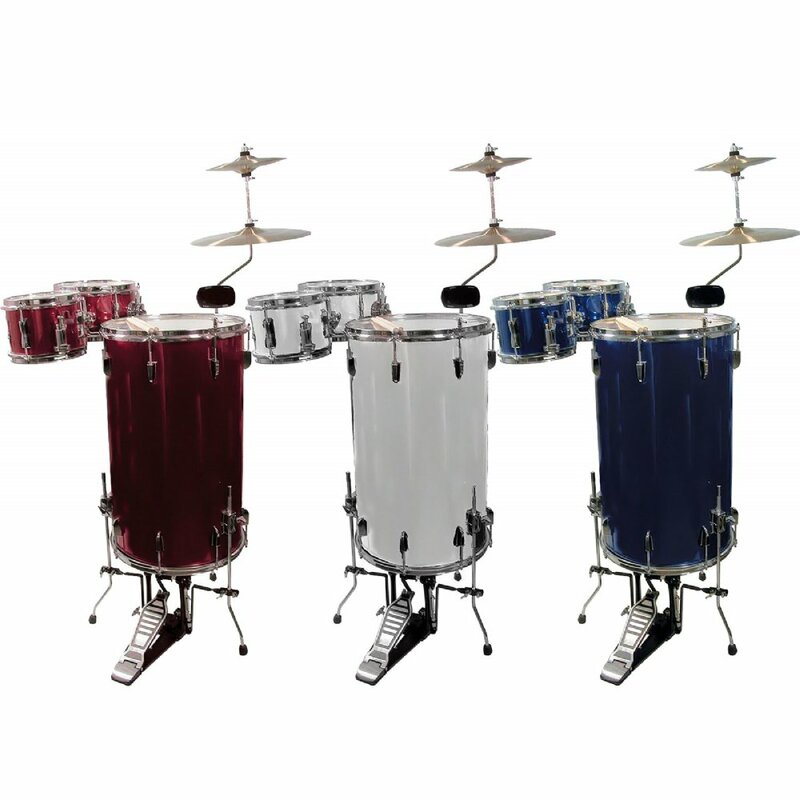 Gretsch offers a variety of configurations of Cocktail Drum Kits. 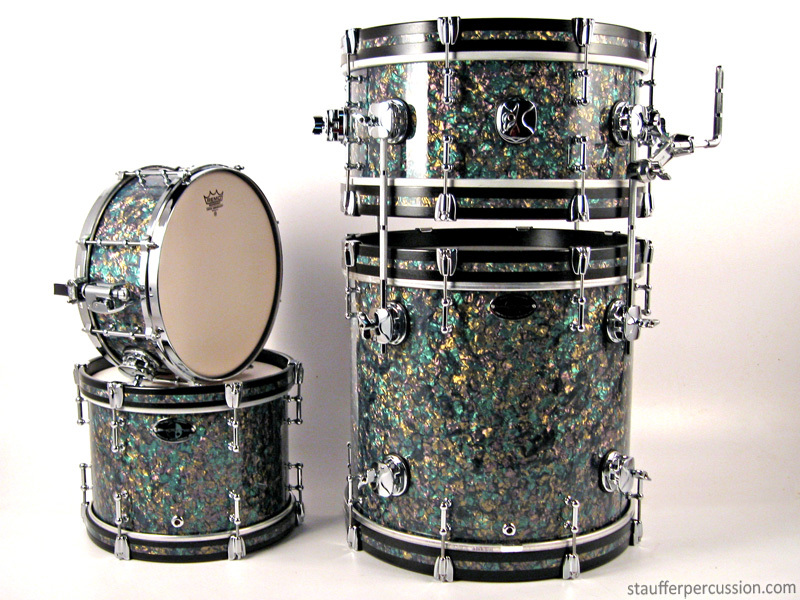 Our sample shown here is from the Brooklyn series, with six-ply Maple/Poplar shells. Sizes are 14 X 24 Bass and Tom in one shell coupled with an 8 X 6 Tom and a 10 X 6 Snare. The use of 30 degree bearing edges and silver coloured sealer is a neat touch that was once present on all Gretsch Kits. 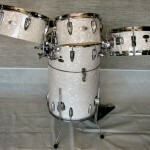 The Cocktail kit as pictured is sold as a shell pack with a suggested list price of around US$ 3,500, and street prices hovering just under US$ 2,800. Available in four stunning finishes including the pictured “Satin Natural”. 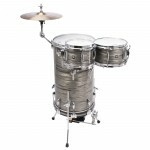 Featuring a 16″x24″ Bass/Tom, 12″x6″ Snare Drum, 10″x6″ Rack Tom and a 12″x6″ Rack Tom. All Happy Hour Kits come with a patented Rail System for installing the kick pedal (Not included but available as an extra). The Tom and Snare mounts are totally adjustable. The tom and bass are latched together allowing for quick detachment to pack the entire kit inside. The Happy Hour comes in a plethora of finishes ranging from traditional wraps to some highly unusual designs. Pricing is around US$1,000 for the kit pictured. 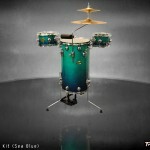 It seems they are only available directly from Billy Blast Drums. Offering three different varieties of cocktail kits ranging from US$1300 for the “Deluxe” to US$1,750 for the “convertible” which as the name implies also converts to a Bop kit. 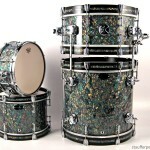 They all feature 8-ply maple shells with 22 finish options! 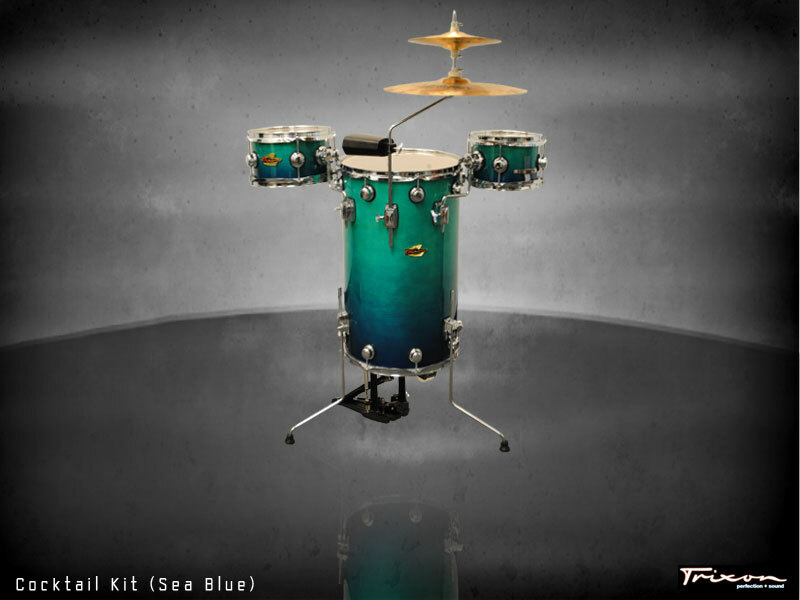 The deluxe kit comes complete with the 16″x24″ Cocktail Drum, 10″x6″ Snare Drum,10″x8″ Tom, Gibraltar Cymbal Boom Arm, Gibraltar Boom Hi-Hat Mount, Gibraltar 9611DC Reversed Pedal, Mini-Gig Rug and Completely interchangeable mounts for unlimited set-up options. Also offered is the “Nester” version at US$1,400, which of course offers the greatest portability in the range.